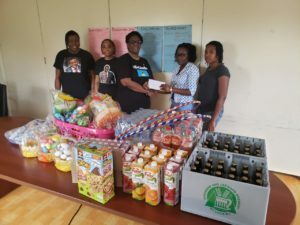 The Botham Jean Foundation made a donation of cash, toys and food supplies Friday to the New Beginning Transit Home and a separate cash donation the Boys Training Centre. Both institutions are located in Gros Islet. The donation was presented by foundation Director, Allison Jean, to assist the institutions in their Easter activities. Alison is the mother of the late Botham Jean in whose honour the foundation was named. Mrs. Jean explained that in her late son’s lifetime, he gave a lot to the New Beginning Transit Home and had a passion for the Boys Training Centre. She said Botham wanted to see the improvement of the lives of the children at both institutions. “We are making this donation so that the children can have an Easter party,” Mrs. Jean said of the donation to the New Beginning Transit Home. She said the foundation was happy to make a contribution to the event so that the children could see and experience what other children experience at this time. At the Boys Training Centre, Mrs. Jean said her son had a vision of transforming the wards at the institution into meaningful citizens of Saint Lucia. “It was a passion that he had. He personally used to tell me how much he felt about the boys at the Training Centre and as he interacted with them, he used to come home and say how he felt that all the boys in here had some good purpose in them and could do things that were positive if they only had people who cared,” the mother recalled. She expressed the view that the work Botham started was extremely important to the Boys Training Centre and Saint Lucia as a whole. She said the foundation was formed to continue the work that Botham started. “We know of the importance of a caring and nurturing attitude that Botham had and want to continue,”she stated. She said the donation of $500 to the centre was to support its Easter activities which include drug awareness. Mrs. Jean disclosed that the Botham Jean Foundation has plans to introduce a football and possibly a cricket coaching clinic at the centre. The Botham Jan Foundation was launched about a month ago with the goal of promoting Christian intervention for social change. Botham Shem Jean was a 26 year old Saint Lucian, who graduated from Harding University and became a Risk Assurance Associate with PwC. According to the Botham Jean Foundation web page, the from a very young age, Botham has been a faithful member of the Church of Christ and devoted his life to helping people who were less fortunate than him. It recalled that on September 6th, 2018, his life was cut short when he was shot and killed by a Dallas Police Officer whose claim was that she mistakenly entered his apartment believing it to be hers. The officer, Amber Guyger, who was subsequently fired from her job, was indicted on a murder charge. The Father says: I will open the store houses and I will pour out all that I have for you. You will reap where you did not sew. You will be given your inheritance by me. You will see why your earthly inheritance was withheld. You will see how deeply you are cared for and how carefully I provided. You will look to me to provide and I will not disappoint. More than just provision there will be justice between me and you as well for I will show you your true place in me and all the privileges you have there. I will fill you with delight. I will sing love songs to you that will lift you all day and comfort you at night. You will rest in my presence and there your heart will soar. You will know deep in your heart that Lordship is my gift. You will know the freedom to be gained by losing your life and embracing my life. It is in your generation that my love will finally be brought to wing and set to fly. All the generations before you had yearned to see what you will see. Many have thought in the hearts, why endure such a trial if not to see your glory but this is my vineyard that I alone will see. All will see that now comes the appointed time that I have set aside to bring all things to me. You will soon delight in your travail for you will be as one who gives birth on the high hill. The glory you will see will eclipse the pains you now feel. You are not birthing your dreams for yourself in this earth you are birthing mine. Therefore, your travail has been epic, and therefore the glory that will be seen will be epic as well. It is far beyond your imagination but not beyond mine. I will do more than just rescue you, I will give you the land. I will pour out upon you such blessing that the world will not understand, but by this one act you will be convinced that you are precious to me. And my love is precious to you. You will have more than just wealth; you will own the well springs of the earth. Your freedom from travail is at hand. Amen to that Chosen One. Very inspiring comment.